1. From the display screen, touch (Settings). 3. Touch (Ext Ans Machine). 4. Lift the CapTel handset and place it next to your external answering machine speaker. Make sure the mouth-piece of the handset is next to the speaker of your answering machine. 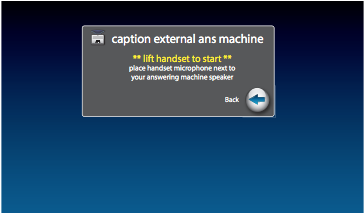 While you do this, your CapTel phone connects to the captioning service. 5. Press the PLAY button on your external answering machine, so that the messages are played aloud. The display will show captions of the messages as they are played. While checking messages, you may operate your external answering machine the same way you normally do, using features such as play, re-play, delete, or save messages. When you are done listening/reading captions, hang up the CapTel handset.